...as long as I lean to the right!!!! There may be hope after all! This is how I feel when I sit...like the Leaning Tower of Pisa! 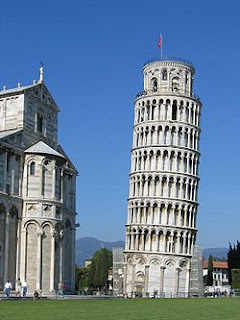 Writing this dumb post, I was undecided as to what to title it: Lean on Me or Tilted...LOL! P.S. I really am grateful that I was able to "make a lap" even if it was only for a little while. You should be too! I hope you start improving more soon! ouch! JP, glad you are feeling a bit better, at least I do hope that you and hurrah on making a lap! Glad you are improving...keep up the good work. I think that's promising news!